FRIDAY, MAY 3RD: 10AM-6PM | SATURDAY, MAY 4TH : 10AM-6PM | SUNDAY, MAY 5TH: 10AM-5PM The DIY approach can work on refreshing your home but think twice about crafting your retirement without advice. Stop by booth 2135 to chat! 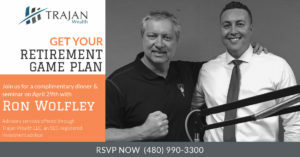 Trajan financial advisors will answer your questions, based on their years of experience in financial services and money management.